Well I've finally done it. I've upgraded our little dehydrating unit we bought from Poland when we were driving a camper van around Europe some 11 years ago. I've been on about buying one for over five years and followed countless eBay searches. My wife just told me to get one in the end and stop talking about it. So I got an all singing and dancing model - in Pink. I've gone for the stainless model with a timer and bizarrely it was cheaper in pink than the black plastic model, so that's what I went for. In fact the colour has grown on me and I think it's kind of stylish! I still went for the plastic trays though as I'd read that people were struggling with the stainless ones with food sticking to them. So I expect to be dehydrating lots of food in the coming months, hopefully lots of berries to store to have on my overnight oats, amongst other things. What do you think? Was it a good investment? What would you be dehydrating at the moment? Ooh you're the second person to buy a dehydrator. I have requisitioned a solar one from my husband and hope it will emerege from the shed in time for the wonderful Welsh summer I am convinced we are going to have! Not enough sun here for a solar one I don't think, although I sometimes thing that my car would be hot enough in the summer! Kev, I just told my husband that we could probably grow tomatoes in the back of the car. Smart wife. If you want something THAT badly, and you know you'll use it, just get it. I'll use it and this way I stop going on about it! I am ashamed to say we didn't dehydrate anything last year, must do better this year. I didn't do much with my little one last year but it was all to do with time! As Lou said, it is I that is slightly guilty of this after your spurred me on - I feel some dehydration comparisons coming on! Fabulous. What's first? Yacon this week! Then maybe rhubarb if I've got any left! I mainly dry herbs, I hope to keep grand sons from our soft fruit this year to try drying some. Dried raspberries are amazing, I add them to cookies and cakes as well as my breakfast. Eeek! Hope to dry my own raspberries! I was very kindly given an excalibur some years ago. Stainless. Still going strong. I find soft fruit that is super ripe do really well in there. Dried strawberries and raspberries are especially nice, add them to cereal or baking. I dont make jam as neither of us eat jam at all, so we dry what we can. weird that we dont eat jam seeing as I eat so much sweet stuff. Blueberries always turn out yucky. I am hoping to see what you dry. I dont bother with blueberries, rosemary or tomatoes. I never grow enough tomatoes to have spare. Getting given one is amazing! No such luck here! Berries are one of the main things I want to do, great for breakfasts! 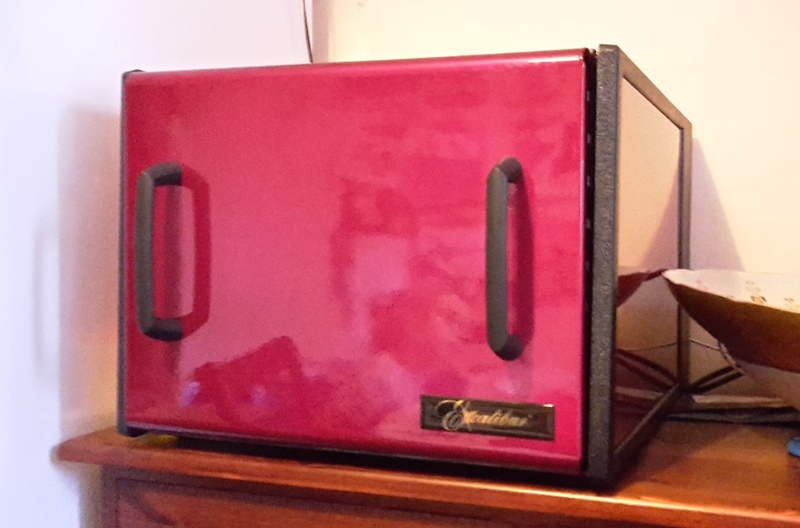 I bought an Excalibur dehydrator, nine shelf, in 2009. I love it. I dry everything I can. I love having Vidalia onion in a pint jar to use all winter long. Same with celery and bell pepper, both of which I season most meats and savory dishes. When I dehydrate zucchini slices, I put those in spaghetti to replace pasta or with pasta to up the veggie content. I love the pink which was not available when I bought mine. Otherwise, I would own a pink dehydrator! Onion and garlic powder would be great for making sauces and rubs, I've got some leeks left as well so I might chuck them in tomorrow. We got a good quality, hardly used one from someone down sizing last year but still need to discover its potential. I kept looking for second hand but the price wasn't much cheaper than new. i had no idea they made dehydrators in pink! i bet your girls love it! i use mine a lot during the summer and fall. my kids like it when i make beef jerky! Tehy were impressed with the colour! I think they'd love fruit rolls when I get goign with it. I have a dehydrator that I mostly use for herbs in the fall and then for beef jerky. I have one of those round ones, it works okay but gives off a lot of heat and I can't leave it running without supervision or the cats get at it! I'm not a fan of dehydrating only because of the time involved with the one I have. The instructions say a piece of fruit will take up to 16 hours...that just doesn't seem economical for me! Maybe if I had a better quality one, I'd have a different opinion! Jerky would be great but it's not high on my list as it's not something we really eat. The round one I had before you used to have to keep restacking it to get it to dry things properly. Raspberries in my old one would be in there days! I WANT one! It could be said that I NEED one don't you think?! I think need with all you grow,. think of all the things you could make the grand kids! While I haven't justified the cost of an Excalibur, I do have a Nesco that I have "run the wheels off" so to speak. I have dehydrated every veggie I've grown....onions, garlic, carrots, peas, peppers, beans and potatoes. They've all worked out well in the last 5 years. I LOVE the pink, and you'll do great with this extra processing method! I'd not really thought of root veg but it will be handy to have some stuff jarred, I've3 been terrrible at having enough to see me through winter. I love my Excalibur! Mine is just plain black - not so pretty as yours. It's a wonderful appliance to have. I'm looking forward to gettign to grips with it. The only drying I do is of mushrooms (Cepes), and they are dried in the sun. Not enough sun here for that! Tomato paste! We dry juices. Apple cider dries to a wonderful syrup. Tomato products dried part way make great sauces - instead of cooking to thicken, dry to thicken. Once you taste your own tomato paste made from real red ripe tasty tomatoes, you'll love it forever. That sounds great! I love dried tomatoes and I'm keen to make more sauces and condiments this year so it'll be great to produce my own ingredients. I just dried pineapple slices and barlett pears in mine yesterday. Any fruit I can pick or get on sale I dry. Be warned though, blackberries and seedy small fruit don't dehydrate well. They just get very hard and all you have is seeds. Everything else..go for it. I dry fruit in season and then at Christmas mix all my jars together, bag it up and give some away as Christmas present. I've also done jerky, but it doesn't last, its eaten way too quickly in my house. I'm goign to be on the look out for cheap fruit now - kiwis would be great as my kids love them! Good tip on the blackberries, I had tried them in my old one and they were like bullets, raspberries on the other hand are amazing. I took the plunge and bought an Excalibur a few years ago and it's brilliant, although I don't use it as much as I could/should. I make lots of fruit leather which youngest daughter in particular eats masses of, especially in the winter. Spiced apple or strawberry (with apple and/or banana) are big favourites. I also dry lots and lots of pear and apple rings and apple chunks (sometimes tossed in cinnamon) for adding to muesli etc. Youngest loves dried kiwi fruit so I sometimes buy reduced bags for that. I do dry tomatoes and use them instead of sun dried tomatoes which I love but are very expensive. The Excalibur is one of the best dehydrators you can buy. But unfortunatly it's also very expensive. A good an cheaper alternative is the BioChef Arizona Sol. Which also works with a horizontal drying system like the Excalibur. Apart from this this deydrator has stainless steel drying trays and a transparent door. For people like me, who don't want to spend so much money for a dehydrator, this is the perfect alternative.